Knitting is easy. Yes, it is! Nothing can beat the satisfaction of knitting up a blanket or a cardigan yourself for your baby. Regardless of the pattern you choose to knit, a homemade knitted item created with love will be a wonderful gift and always be highly appreciated. 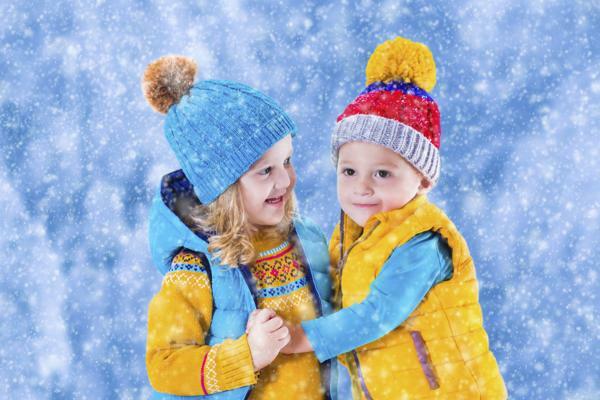 If you are a mum-to-be or thinking to doll up your little one in some cuddly woolens, then here you will find a list of patterns that could be used for making some beautiful knitwear. Tiny tots will not only look cute wearing them, but it will also become a creative hobby to fill up your time. Here is the list of a few patterns that will help you create your own knitted masterpiece. Here's wishing you 'Happy Knitting'!! 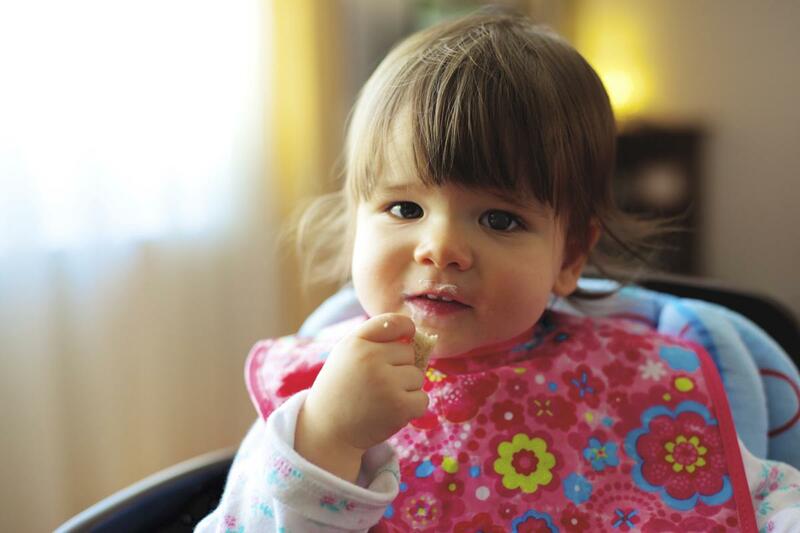 A bib prevents the food or liquid spills from soiling the baby's clothes. It is therefore required that the pattern used for knitting a bib be close and tight, so that the spills don't soak through easily. You can add charm by decking up the bib like a cat by attaching knitted ears/eyes and nose, or just knit it in the shape of a heart. Adding colors to the bib would also make meal times fun times! You can incorporate stripes by tying the yarn of the first color to the second color. After you are happy with the stripe width, tie the second color with the first color or use a third color and start again. The yarn used can be 'worsted weight yarn', which is a medium weight yarn, and size 6 or 7 needles. A nicely knitted bib can be a very useful accessory for your kid. Always use cotton yarns while knitting bibs, as they are more absorbent than acrylic, and can be washed easily. 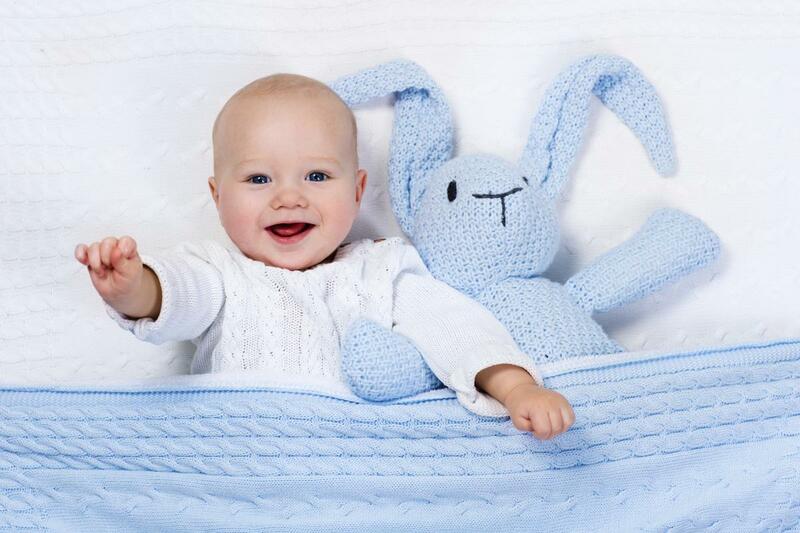 A cozy way to wrap your baby after a bath would be in a knitted towel or a blanket. You can experiment with different patterns, as knitting a blanket or a towel is a long-term project and requires time. Many vertical or horizontal panels are required to be knit and sewn together. You can make a towel with checkerboard design by knitting each check with a different colored yarn and then sewing them together; or else just keep the checks black and white. You need to predefine the size of each check (E.g., 5 inches) and the number of checks that you will require to make a towel. After the checks are ready, sew them together. You can form a hood by knitting a triangular piece, and sewing it to one corner of the towel. Another pattern that you can try is making stripes. Start with 20 stitches and knit until you get the desired width of the stripe. Cast off and start with another color. Keep on alternating between colors. Once you are done with knitting about 10 stripes, sew them together properly else the blanket will look crooked. Just make sure the yarn that you'll be using for knitting a towel or a blanket is soft and absorbent. Baby pillows are 'U' shaped pillows and are used to support a baby's head while sleeping. You can knit a baby pillow in a day because of the simplicity of its design. They can really perk up your baby's bedding. They can also be a unique gift for someone's baby. They are made with soft and easily washable cotton yarn. One of the designs for knitting a pillow can be a 'smiling worm', where initially you have to knit an outer cover like a hollow pipe. Stitch it from the reverse side in the shape of a worm leaving an opening for the filling. After stuffing the pillow as evenly as possible with polyester fiberfill, the opening should be sewn shut. You can sew add-ons to your pillow like stripes, antennas, eyes and nose using different colored yarns. You just need some imagination to play around with the patterns. You can also deck it up with some knitted bows, stars and laces for your pretty princess. Knitted soft toys can become very special gifts for children. Just use some bright gorgeous colors, soft yarns, and a little imagination, and you will be surprised how a ball of wool will get transformed, one stitch at a time, into a 'one-of-a-kind' gift. To make soft toys, it is always preferred that you use needles a few sizes smaller than the recommended size. It is because you will then get a tight knit and the stitches won't stretch and look disheveled when stuffed. Stuffing the toy should be carefully done so that you don't end up with lumpy toys. Don't overstuff or understuff. Stuffing before sewing is the general rule of thumb, but sometimes, you need to sew as you stuff so that the part to be stuffed is never far from the opening. You should always knit a soft toy from the bottom up and then give it any shape you want. 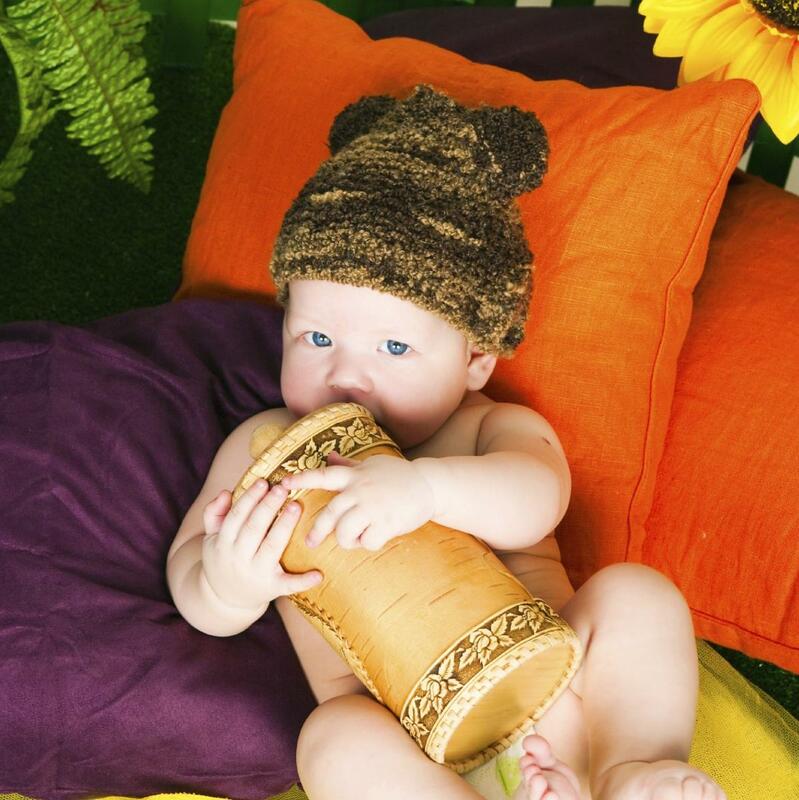 A totally delightful pattern, with all its charm, a 'pom-pom' cap is absolutely fun for the child who receives it. It's just a basic cap pattern with knit-on embellishments. 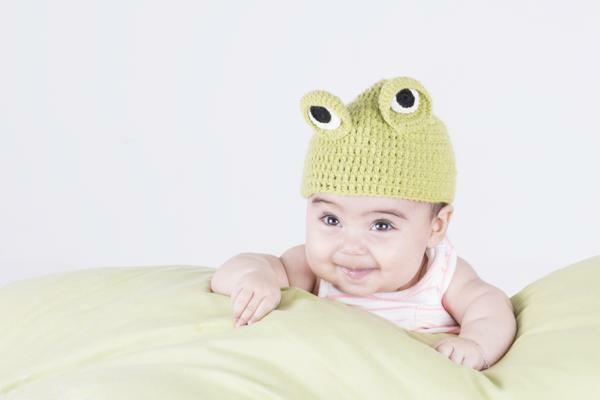 An ear flap hat is an ideal way to protect your child from the chilly weather as it wraps over the ears. A scarf is a versatile accessory and for those who are a little adventurous in their knitting, can try out exciting patterns. For a scarf, you can start with 10 stitches and knit a meter long vertical stripe. You will require 3 such stripes. Knit them in different colors or just take shades of the same color: a light brown, medium brown and a dark brown shade. After you are done with the stripes, braid them to form a scarf. A 'scoodie' - made out of the combination of a scarf and a hoodie, can add the fun element as well as up your child's style quotient. While knitting caps, hats or scarves, it is recommended that you use bright colors, and also vary the type of yarns. You can go in for a sparkle yarn, a ribbon yarn or a multicolored yarn. 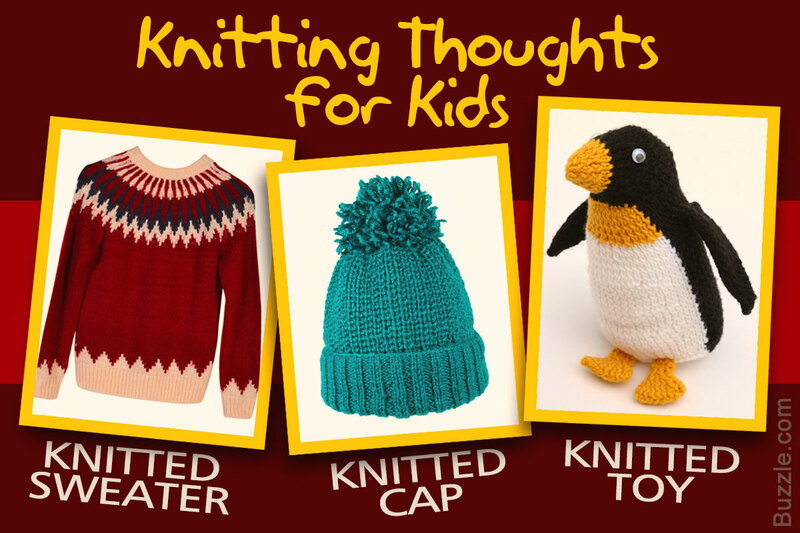 Be it a cap, a hat, a scarf or a scoodie, you can always stitch some knitted add ons. Mittens are like gloves and can be used for babies and toddlers. Knitting a heart or simply playing with colors will make them lively. These knitted cozy mittens will keep your baby or toddler warm. They also serve as an easy-to-knit option for the first timers as they are just required to be knit round, and at the end, the thumb is added. You can use 'mohair yarn' or some other bulky weight wool yarn to knit them. Similarly, booties are also knitted in one-piece and can become an awesome first-time project for a new knitter. You can attach ribbons, which can double up as laces that you can tie to keep the mittens and booties from slipping out of the hand or feet. Pullovers, cardigans or sweaters require some time and inclination, but the level of satisfaction that you will get after completing your garment will be worth the effort. Apart from the usual, you can knit up a hoodie, which is an improvised version of a pullover, where a hood i.e., a knitted triangle, is attached to the yoke. Whereas, a poncho is a blanket like rectangular or circular coat, having a hole in the center for the head. You can add a ribbon running across the rim of the poncho or just leave fringes at the bottom of the rim. You can be as creative as you can with this type of apparel, because of the amount of knitting that goes into fabricating them. Dresses in pink will be an instant hit amongst the girls. It just needs a simple A-shape knitted dress to make your 'lil' one a princess, but there's a lot more, that you can do. You can go on to create a sweater dress that is comfortable yet feminine. They are usually worn with tights and boots. You have to start knitting a dress from the bottom up in one-piece. The knitted sleeves must be attached before you move on to the yoke of the dress. Like all other knitted garments, even dresses, when primped up with knitted accessories like flowers, laces etc., will become an absolute wardrobe must-have for a little girl. - Garter Stitch: Every row in this type of knitting is made with the same kind of stitch. It is also called 'plain knitting'. This stitch produces a reversible effect with raised horizontal ridges on both sides of the fabric. The best part about this type of stitch is that it does not curl. You can make a complete fabric in garter stitch, it will be the most stable and sturdy piece of clothing. If you are a beginner, start with larger needles and thicker yarn. By doing so, you will get loose stitches and will get plenty of space to maneuver. If you use smaller needles and thin yarns, the stitches will become tight and close. There should be same number of stitches on each row. Be careful of the number because if you drop or increase the number of stitches, you may end up disturbing the width of your cloth, and also there will be holes developing due to the dropped stitches. - Single Rib: Knitting and purling are the only two types of stitches that you will be using when knitting any garment. When you turn around the knit stitch you will see the purl stitch. How do you distinguish between the two? It's simple! A knit stitch will lie flat and the purl stitch will be bumpy and raised. A single rib pattern is formed by alternating a knit and a purl stitch on the row, so that you get vertical columns of a knit and a purl. This pattern produces an elastic border, and it is knitted with a smaller needle because knitting with larger needles lessens the elasticity. If you just go on with a knit stitch you will be knitting a garter stitch. Another variation of the rib is the 2X2 type where instead of one knit and one purl stitch, you alternately weave two knits and two purl stitches in each row. You can alternate between the knit and purl stitch horizontally, by knitting one row in knit and one row in purl. This will create a pattern which on the smooth side is called the stockinette stitch and on the bumpy side is called the reverse stockinette stitch. - Seed Stitch: To get a seed stitch, you just have to do a knit (K) stitch and a purl (P) stitch for the complete row, and on the next row you do a purl (P) and a knit (K). In the third row, again do a knit (K) and purl (P) and keep on following the pattern. Just keep a check to make sure that you are not knitting a knit on a knit and a purl on a purl, because if you do that, you will be knitting a rib. Similarly, if you do two stitches of knit (K) and purl (P) and then change the sequence to purl (P) and knit (K) for the next two rows, you will be creating a moss stitch. These were just a few of the knitting patterns. There are a lot more to check out and experiment with. You can use the simple patterns in the beginning, but don't stop there. Just keep on challenging yourself to learn new patterns and knitting will continue to remain an exciting adventure for you.